Make a bold statement in your garden by hanging your bird feeder on the Gardman Black Fleur-De-Lis Shepherd Hook. 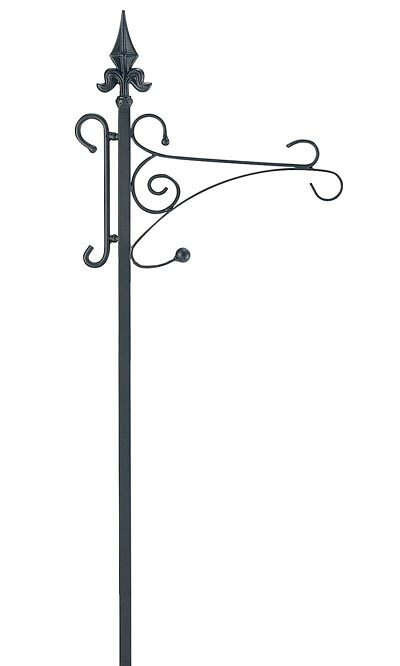 This ornate hanger not only creates a convenient display spot in your garden; it also offers classic style thanks to its black color, fleur-de-lis finial, and scrolled detailing. A square, steel shaft provides height to the piece, and a 13" long arm extends from it to accommodate bird feeders or other adornments up to 24" in diameter. A small curl opposite this arm brings a balanced hint to the piece, while orbs on these scrolls contrast the square shaft. The 10" long, step-in base makes installation simple, and helps the item remain stable in your soil, while the all steel construction creates a durable piece. The black, powder coated finish enhances the classic motif, and protects the hanger from the elements. Create a stately look within your garden using this Black Fleur-De-Lis Shepherd Hook.